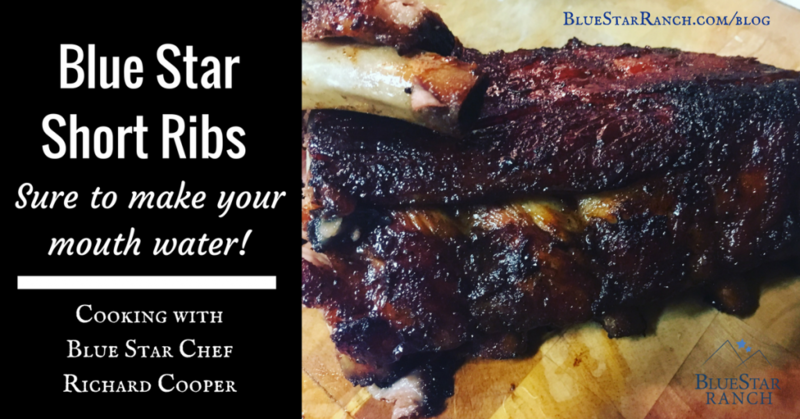 This is recipe that works for baby back ribs or spare ribs. Here we did spare ribs for lunch at the ranch! Pre-heat your oven to 250 degrees F. Ribs need to cook super low and slow for hours to breakdown their connective tissues. Higher temperatures will result in tough ribs. Mix well and set aside. This will make enough rub for two racks of ribs. Take your ribs and flip them bone side up. Take a small paring knife and loosen the membrane that covers the ribs. Take a paper towel and pull the membrane off. Next take a sheet of tin foil that’s 8 inches longer than the ribs on each side and lay it flat on a clean work surface. Place rib on foil and season on both sides with half of the rub. Bring the horizontal sides of the foil up and over the ribs and seal them off, leaving some space (about an inch) over the ribs. Then do the same for one side. Next, at the open end of the foil add the apple juice and vinegar. Seal the foil. The object of this is to keep the liquid inside (because it will be used later to make a BBQ sauce). Transfer the ribs to a sheet tray and bake for 31/2 to 4 hours. The ribs will be done when you can see the meat has pulled back from the bones and you can easily pull a bone out with a twist. Next take a medium sauce pot and place one rib at a time over it letting it sag into the pot. Using kitchen shears or a paring knife, cut 2 holes in the center at the lowest point, letting all the accumulated juices run out into the pot. Repeat for the other rib. Set the ribs aside on their baking tray. Bring the liquid to a boil and reduce to a simmer until thickened. Set your oven’s broiler to high. Take the ribs out of the foil and place back on the sheet tray. Using a pastry brush, generously glaze the ribs with the sauce and place under the broiler for about a minute – maybe less, depending on your broiler’s heat output. Watch them closely!!!!!!! At this point you can ruin hours’ worth of cooking in a matter of seconds!!!!! Take out your ribs and let cool for 5 minutes. We tried this for dinner tonight and it did not disappoint!! It has become our new rib recipe, keep the recipes coming please. After enjoying your many delicious meals at Blue Star you have a lifetime fan.